Over the past few years, I’ve had a bunch of exciting and strange adventures in the world of filmmaking. In June 2011, Jordan and I traveled to Los Angeles to interview screen icon Helen Mirren for our documentary about Warren Ellis, thanks to resourceful efforts of co-proudcer Matt Pizzolo. Helen was awesome, and didn’t even make any jokes about Matt and Jordan’s matching outfits. In July 2016, I was fortunate enough to travel to Santa Fe, New Mexico for a screening of Trip House and Neil Gaiman: Dream Dangerously, hosted by legendary Game of Thrones creator George RR Martin. It was an amazing evening, and I can’t wait to return to the theater. 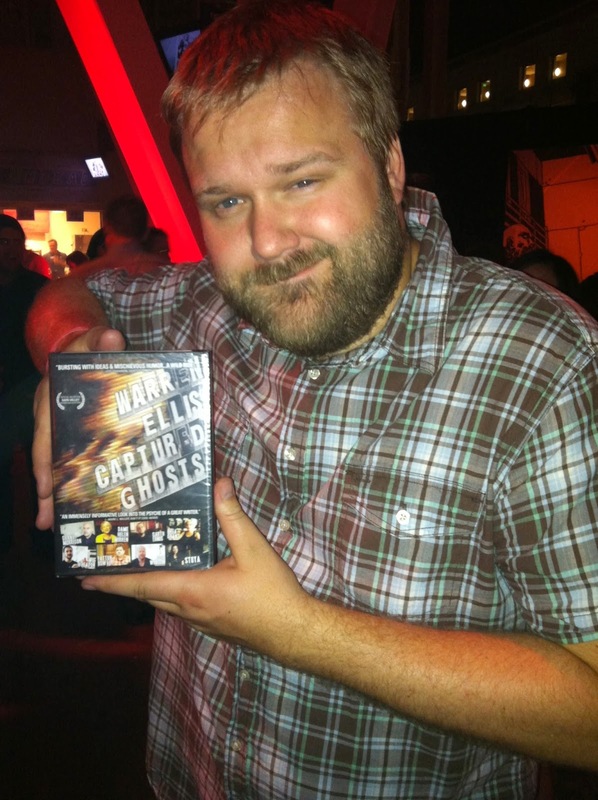 The Warren Ellis film had many celebrity fans, including 30 Rock‘s Dotcom and The Walking Dead creator Robert Kirkman. Wong Kar-Wai is my favorite director, and a visual storytelling master. At 2013′s Comic Con, I was lucky enough to attend a party for his film The Grandmaster with Jordan and my girlfriend Jennifer. Jordan and I wanted to get a photo of him in the style we call the ‘Wong Kar-Wai shot,’ but he was not having it. He took the camera out of my hand and posed our group, then had an assistant use his hand to bounce the light, which led to this great photo. In August of 2013, Jordan and I traveled to England to follow Neil Gaiman on his Ocean at the End of the Lane book tour. We also traveled to the actual Ocean at the End of the Lane, this pond in East Grinstead, England. There, we met a Dutch family who was confused about why we were visiting, but they gave us tea and biscuits. Here’s a rare on set shot of me at work directing Tenspotting, a Doctor Who themed short film. I’m working with actors Chloe Dykstra and Kit Williamson to bring a scene to life. Here’s the cast and crew at the end of a night shoot on Trip House. Also on set of Trip House, here’s me and DP Jordan Rennert with actress Amber Benson. I’ve been a fan of Amber’s since watching Buffy, so it was very exciting to get the chance to do a project with her! While working on the Warren Ellis doc, I got to travel to the set of The Avengers and interview director Joss Whedon. It was quite a trip, and a wonderful opportunity to see blockbuster filmmaking in action.